Note: You need a browser capable of displaying SVG images to see the keyboard layouts. 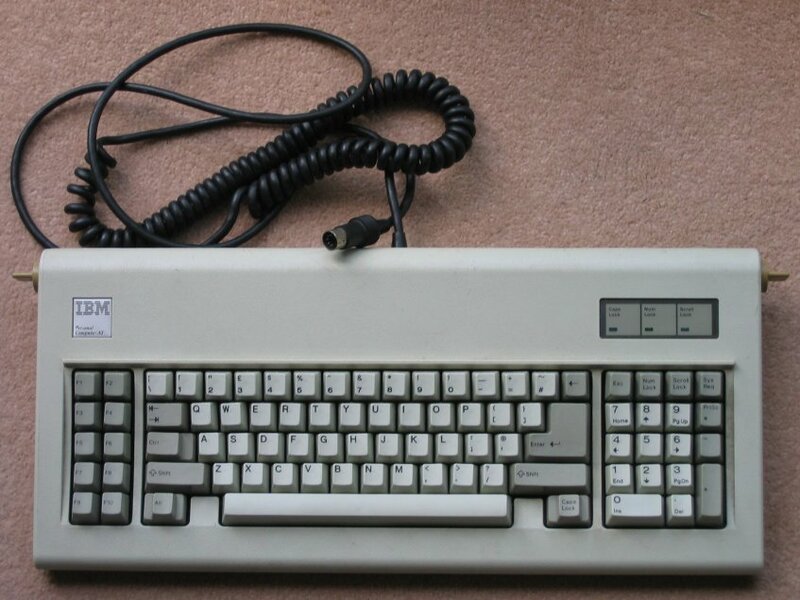 The IBM 6450225 is better known as the 84-key keyboard supplied with the IBM PC-AT. To be precise, it's the UK model. The keyboard, pretty much by definition, uses the normal AT pinout and connector. The lead is not detachable unless you open the case and disconnect it from the PCB. The connector at that end is a 3×2 Berg connector, which seems to be common to a number of IBM keyboards. When sent an identify command (0xF2), the keyboard responds only with 0xFA (acknowledge). The 6450225 uses the AT keyboard protocol. The scancodes it returns are a subset of the "Set 3" scancodes returned by 122-key keyboards. Unlike on an extended keyboard, the scancode set cannot be changed. If you go by keycaps, the codes correspond to set 2; if you go by key position (or by the behaviour of the extra contacts under the Enter key) they correspond to set 3. Compared to the US model, the Backslash and Tilde keys are swapped over. As if describing these keys unambiguously wasn't difficult enough already. All keys return make and break codes. Smaller numbers shown in circles are holes in the keyboard with no springs, corresponding to unused positions covered by double-sized keys. The scancode numbers, being a subset of the ones used by 122-key keyboards, are not contiguous. The gaps correspond to the missing 24 function keys at the top, and the block between the main keyboard and the numeric keypad. John Elliott 13 February 2011.